The right tool for the job makes all the difference in the world. The Chemical Guys Gray Workhorse Microfiber Applicator pad is the perfect pad for waxing and sealing polished metal wheels, hood ornaments, rims, bumpers, and trim on any automobile. The premium pad is made with super soft 70/30 blend microfiber. This blend stays soft through dozens of wash and dry cycles, and resists scratches and swirls on sensitive automobile metal finishes. The thick foam core feels plush and firm in the hand and helps ensure even coverage while spreading wax coatings over any surface. Chrome bumpers, exhaust tips, and trim pieces can easily stain with water spots, oxidation, and carbon buildup without proper protection or cleaning. Baked-on brake dust and road grime can corrode and destroy polished metal, clear coated, or powder coated wheels and rims. Lay down a solid layer of sealant or wax protection with the Gray Workhorse Applicator Pad. Use the premium soft applicator to spread JetSeal on chrome, aluminum, or stainless steel trim, bumpers, and wheels. The Gray Workhorse Applicator is the perfect pad for sealing wheels and rims with Wheel Guard for durable protection against brake dust and road grime during any full detail. Choose the Gray Workhorse Microfiber Applicator Pad to seal and protect any polished metal parts on any vehicle. The Grey Workhorse Microfiber Applicator Pad spreads the perfect coat of your favorite Chemical Guys sealant or wax on polished metal car parts. Car enthusiasts love chrome for the bright shiny finish, but hate tarnish, water spots, and carbon buildup. Protect bumpers, exhaust tips, trim pieces, door handles, hood ornaments, wheels, and rims with the perfect coat of sealant or wax spread with the Gray Workhorse Applicator Pad. The plush microfiber applicator is made with premium 70/30 microfiber for a soft touch that won’t scratch or swirl sensitive metal surfaces. The thick foam core feels plush and solid in the hand, and spreads the perfect even coat over any flat or contoured surface. Protect bumpers and hood ornaments from water spots and stains with JetSeal, or Butter Wet Wax. Spread the perfect coat of Wheel Guard to repel abrasive and corrosive brake dust from wheels, rims, and hubcaps with the Grey Workhorse Applicator Pad. Avoid cross contamination between sensitive automotive surfaces and use the right color-coded towel and applicator for the right area. Choose the Gray Workhorse Microfiber Applicator Pad for polished metal throughout any automobile. Cross-contamination between paintwork, wheels, leather, and glass can ruin a detail job in one swipe: grease from a tire can stain leather seats; wax from paintwork can streak glass; dressings and creams from plastic and leather can leave spots on paint. The Chemical Guys Workhorse Microfiber Line covers towels and applicator pads for every area of the automobile. Use the premium microfiber towels to clean exterior and interior vehicle areas, engine bays, wheels and tires, undercarriages, leather upholstery, metal parts, and more. Use the right towel for the right area, and avoid cross-contamination between sensitive leather and fabric interiors and greasy exterior surfaces. Now choose the right applicator pad for the corresponding area! Use Green Workhorse Applicators for exterior paintwork, plastic body panels, and carbon fiber trim pieces. The Yellow pad is perfect for dressing interior plastics and vinyl upholstery. Use blue applicators to coat and seal windows against water spots and contamination. Gray Workhorse Applicator Pads are perfect for coating metal parts like chrome bumpers, polished aluminum trim, and any type of painted or polished wheel. Choose Tan Workhorse Pads to spread premium leather creams on sensitive leather upholstery. Keep plastics and rubber pieces like bumper trim and tires deep black and shiny with the Black Workhorse Applicator Pad. Choose the right tool for the job with the Workhorse Lineup of towels and applicator pads. Keep your microfiber applicator at the peak of its softness and performance with Microfiber Wash Cleaning Detergent Concentrate. 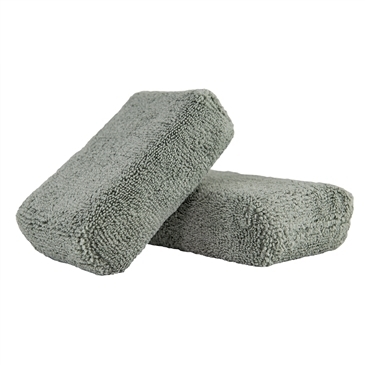 If used regularly, Microfiber Wash will retain and restore microfiber softness and protect your microfiber towels keeping them soft and absorbent.